Communities for Change (C4C) is a seven week innovative programme designed by MIT’s Presencing Institute in partnership with Impact Hub Harare to challenge the way leaders and citizens think and present a new theoretical approach to addressing social problems. 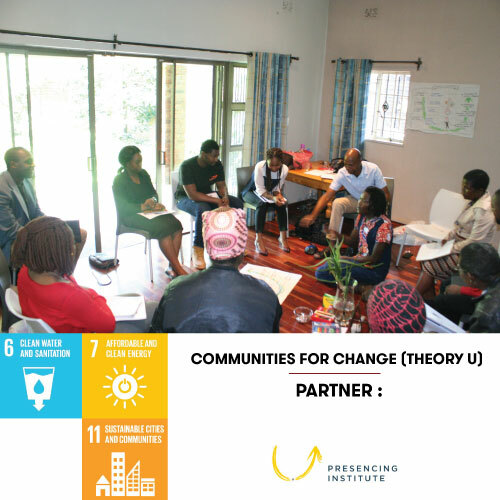 The Communities for Change program offers citizens the opportunity to go through the Theory U course which helps to reflect on self, challenges facing society and how a collective approach can bring about social change. Impact Hub Harare has chosen to use this approach to tackle the challenge of affordable, sustainable energy in Zimbabwe. Zimbabwe has some of the greatest natural resources which are often under-utilized leading to insufficient sourcing of electricity, poor management of waste and unclean cities. The need to promote and invest in Green Energy is an emerging discourse in Zimbabwe. As recognized in the United Nations Framework Convention on Climate Change (UNFCCC), globally, there is a need to focus on “greenhouse gas emission, mitigation, adaptation and finance and a drive towards sustainable energy”. Promoting Green Energy not only has environmentally positive effects, it promotes the increase in job creation and economic benefits to a country and its investors. Increasingly, countries such as Zimbabwe have recognized the need to divert from climate and environmentally damaging sources of energy such as coal and wood to more sustainable, affordable clean sources. Zimbabwe relies heavily on hydro-electric power which is not sufficient enough given the increase in demand. In rural areas, about 80- 90% of people depend on wood fuel and kerosene for cooking and lighting. Coal has also been one of the main sources of power; the increased use of such sources is damaging to the climate and health of those in the community in which it is mined. There prototypes are being set up & tested at Impact Hub Harare and and will be rolled out into our local communities in the coming year.